Q1. 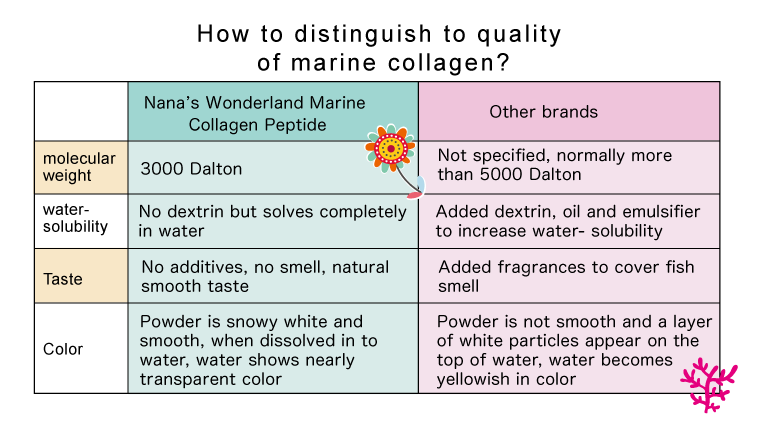 How to distinguish the quality of marine collagen? Q2. Why do we need to take collagen supplements? Collagen is the most abundant protein in the human body. It is regarded as the substance that holds the whole body together and can be found in the skin, bones, joints, tendons, ligaments, teeth, muscles, intestines and connective tissues. Human body contains 3 kilograms of collagen and is responsible for the maintenance, strength, and flexibility of healthy skin, joints, and other parts of the body. It is also responsible for the replacement of dead skin cells. Studies have shown that our body contains the highest level of collagen by the age 20 and as we age levels of amino acids (protein building blocks) our body needs to make collagen protein are reduced at more than 1% per year. At the age of 30, the collagen reduction has started to become faster and becomes visible as we start to have wrinkles and our skin loses elasticity. 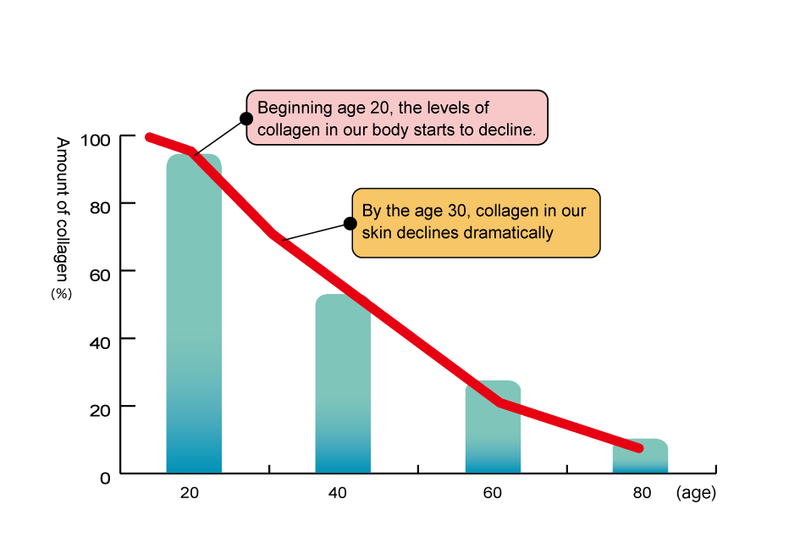 Between the age 25 to 35 our body’s ability to make collagen protein reduces by 20%, by the age 35 to 45 reduces by 40%, by the age 45 to 55 reduces by 60% and when we reach the age 65 to 75, our body’s collagen protein level is only 20% of the level during age 20. Studies show that the dermal skin layer of an aged 60 human body is 25~30% thinner than a younger body. The main reason is the reduction of collagen in the body, especially apparent in female, resulting to wrinkles, loss of firmness and aging of skin. Thus in -taking collagen supplements before the early signs of aging could effectively aid on slowing down the deterioration and ageing of our body parts. Q3. What is the function of collagen in human body? Collagen is the key to a youthful and supple skin. It makes up 75 percent of our skin. Collagen gives the skin its strength and durability and is responsible for the smooth, plump appearance of young, healthy skin. The degradation of collagen in our body reduces the skin’s strength which leads to wrinkles that accompany aging. Collagen is the main protein found in connective tissue such as Cartilage and tendon. Cartilage is a firm, rubbery material that covers the ends of bones in normal joints. Its main function is to reduce friction in the joints and serve as a "shock absorber." The shock -absorbing quality of normal cartilage comes from its ability to change shape when compressed. Since collagen provides cartilage with its strength, and creates a framework that houses the other components of cartilage, when collagen level in our body deteriorates, it can make increase the friction in the joints and cause pain or inconvenience as we move around. Around 20% of bone is composed of organic compounds, of which 80% is collagen, the rest being non-collagenous proteins. Collagen is a fibrous protein that provides a soft framework, and calcium phosphate is a mineral that adds strength and hardens the framework. When collagen level is supple, our bones and teeth are strong, dense and elastic. As collagen level in our body deteriorates, our bones become brittle and result to common joint disorder such as Osteoporosis. Collagen, the major connective tissue protein, is an integral constituent of muscle and, because of its occurrence and characteristics, is a factor contributing to the texture of meat. If collagen level is low, muscles become loose and weak. Collagen is the major component of the white sclera and the clear cornea, both of which make up the outer coat of the eyeball. The cornea, which is a complex group of proteins and cells, is a transparent structure that is responsible for the refraction of light, and it is the initial point of visual contact. Your eyes are made up of both fibrous and a more watery gelatinous -type -tissue both which require optimal collagen to make them strong and hydrated. Therefore, the reduction of collagen can result to dry eyes. The growth of healthy and shiny hair is basically founded in healthy skin. In the dermal skin layer, the very roots of your hair are coated in collagen which delivers necessary nutrients for thick, shiny and healthy hair. The loss of collagen may result to dry, dull, damaged hair and brittle nails. When tissue is first wounded, blood comes in contact with collagen, triggering blood palates to begin secreting inflammatory factors. Platelets also express sticky glycoproteins on their cell membranes that allow them to aggregate (blood coagulation), forming a clot. This clot stops active bleeding. With low level of collagen, blood does not easily coagulate and once we get injured, the wound does not recover speedily. There are different types of collagen in the human body. Each group of collagen has vital roles in many of the body's functions, such as formation and maintaining of internal organs. 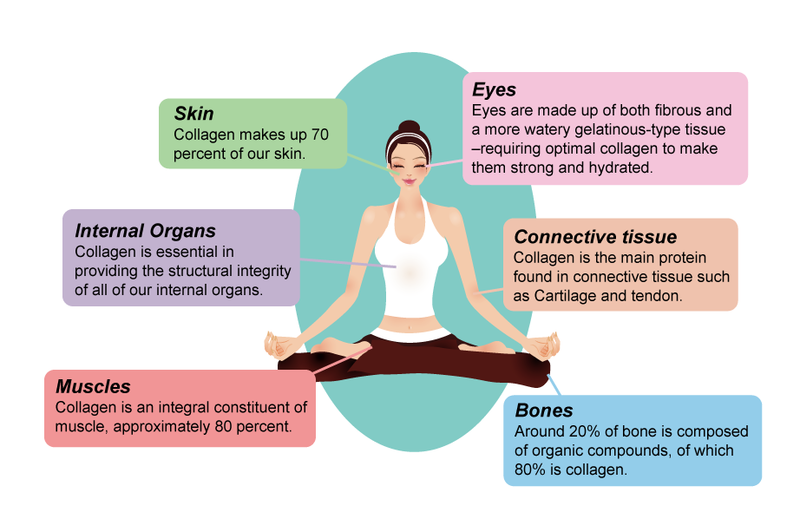 Collagen is essential in providing the structural integrity of all of our internal organs. Q4. 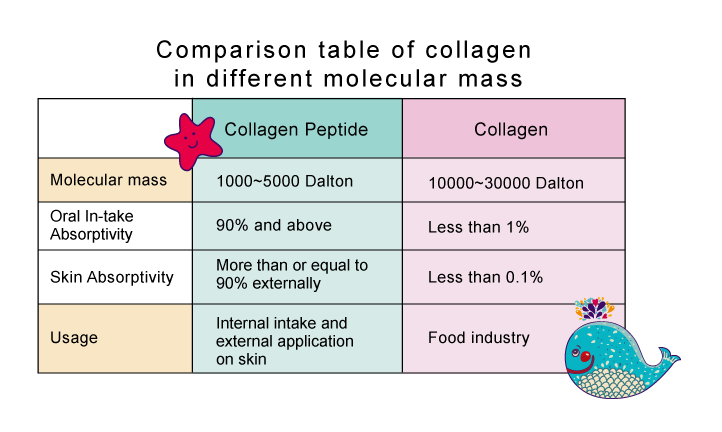 What are the different molecular mass of collagen and usage? Q5. What is the function of Hyaluronic Acid in the human body? Hyaluronic acid, also known as hyaluronan or hyaluronate, is a carbohydrate, occurring naturally throughout the human body. It can be several thousands of sugars (carbohydrates) long. 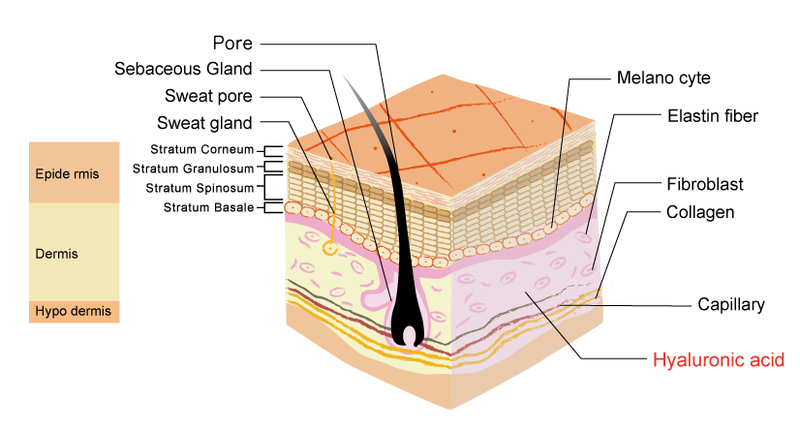 Its molecular mass is between 100,000 to 1,000,000 Dalton present in large amounts in the spaces between skin cells. It helps to retain over a 1000 times its weight in water within the cells of skin, making it an excellent moisturizer. Hyaluronic acid occurs throughout the human body such as skin, eyes, joints and tendons. Hyaluronic acid lay in the inner layer of the skin to retain the hydration of skin, maintain skin elasticity, cushions joints and nerve tissues and has an antibacterial and anti-inflammatory activity. With such a widespread occurrence of Hyaluronic acid in our bodies, it is logical that Hyaluronic acid also has multiple functions. Hyaluronic acid is a gel-like water holding molecule that is the space filler and cushioning agent in the body. It improves skin hydration, maintains skin elasticity and cushions joints and nerve tissues. The manufacture of Hyaluronic acid, just like every single protective agent in the body, declines with age. Decreasing levels of hyaluronic acid accompany the ageing process, which makes our skin lose elasticity and the formation of wrinkles. Apart from suppleness, one of the important factors of youthful skin is the fast recovery of scars from wounds. Hyaluronic acid facilitates the transport of essential nutrients and solutes which is mainly due to its water retention ability; a well hydrated cell increases the mobility through its surface. Hyaluronic acid also helps modulate the inflammatory signals necessary to initiate wound healing process. Q6. What are the sources of Hyaluronic Acid and the difference? Nana’s Wonderland Marine Collagen Peptide uses the best Hyaluronic acid from Rooster comb extract to ensure the best hydration effect! Q7. What is the function of Ceramide in the human body? Ceramides are natural lipids and are a major component in surface skin structure (takes up approximately 40~55% of the outer skin layer). They serve as part of the "glue" that holds surface skin cells together, help skin retain moisture and serves as the protective barrier of the skin. The ability of Ceramide to retain moisture is 16 times more of Hyaluronic acid, it’s the best moisturizer known. Studies have also shown that Ceramide extracted from rice can effectively fight the activity of Tyrosinase, which is the cause of dark spots and freckles in the skin, hence maintaining the fairness of the skin. A recent research from Japan stated that in-take of 0.6~1.2mg of Ceramide from rice extract has hydration, whitening, anti-wrinkle and calming of dermatitis on human skin. It has also proven that through Ceramide taken into the body can increase the level of Ceramide in skin level, reaching the maximal effect. Japan has been the leading researcher in the world of Ceramide from rice extract. Since the cost of this extract is high, it is not commonly used in the health / beauty supplements in the market. Nana’s Wonderland Marine Collagen Peptide is 100% made in Japan from the processing of raw ingredients to packaging. Our product uses the high cost Ceramide from rice extract. Nana’s Wonderland Marine Collagen Peptide is the most exquisite gift we could give to our body. We promise only the purest and the best for our consumers, because you deserve the best!